Vegan Chocolate Cupcakes – I bet you this is the easiest cupcake recipe you will ever make yet are the best chocolate cupcakes you will ever have!! 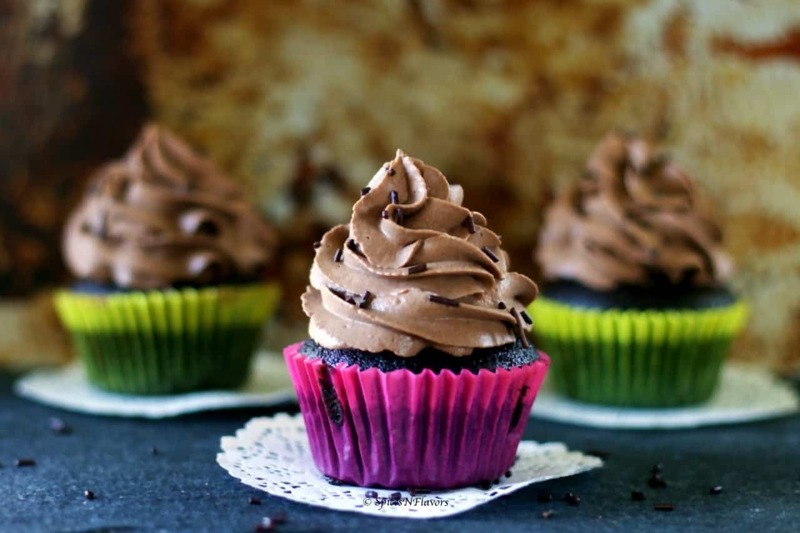 Soft, Moist, Simple, Chocolaty and Easy cupcake recipe that you need to have in your books. No Eggs, No Curd, No Butter, No Condensed Milk or Milk Powder. You will be surprised to learn these cupcakes uses basic ingredients you probably have at all times in your pantry!! 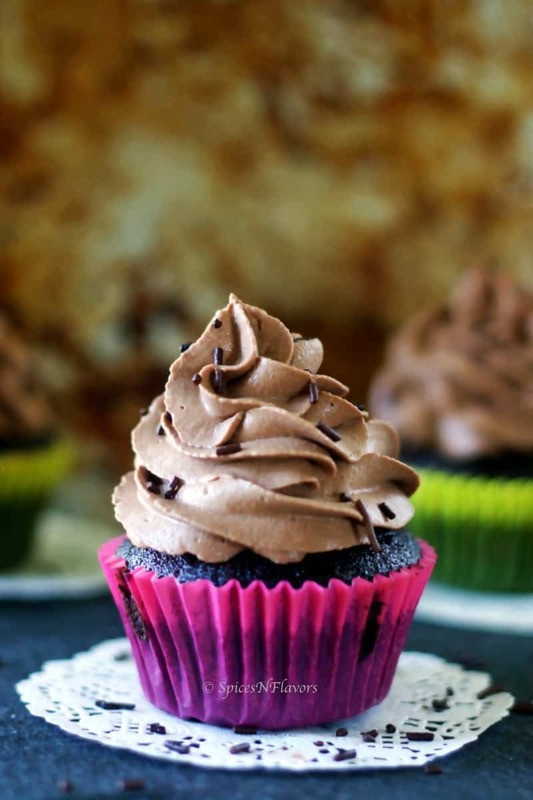 Vegan Chocolate Cupcakes are a very basic cupcake recipe that every baker needs to know. In fact, there are few selected recipes that you need to have in your books if you are just starting to bake or even if you are a pro as you can use these basic cake recipes and then modify it to get any flavour of your choice. 6. Hand selected cookie recipe like this and this. 7. Some tea time cake recipe like this or this. 8. And basic frosting recipe in your collection. If I am claiming it to be the best chocolate cupcake recipe ever then trust me on this and give it a shot for yourself and then let me know your thoughts on it. 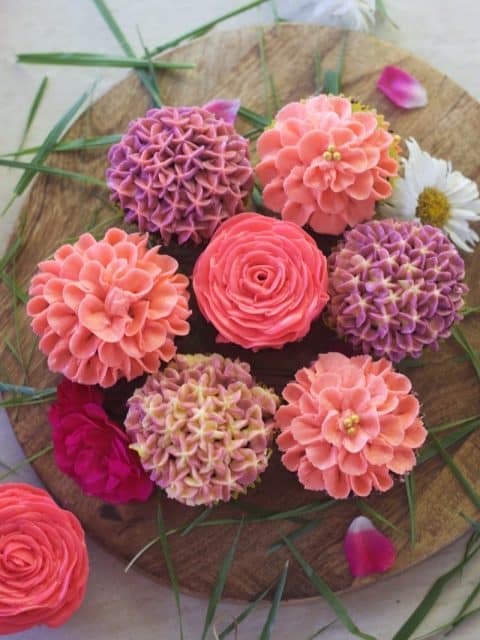 Wondering what so special that makes it the best cupcake recipe? A. It’s an ultra easy cupcakes to make. All you have to do is sieve together the dry ingredients. Add wet on top it, mix and bake that’s it. No fancy equipment or ingredients needed. B. This is also a super moist chocolate cupcake recipe. What makes it so moist? Oil!! yes, oil is that secret ingredient which makes these the best vegan cupcake recipe. 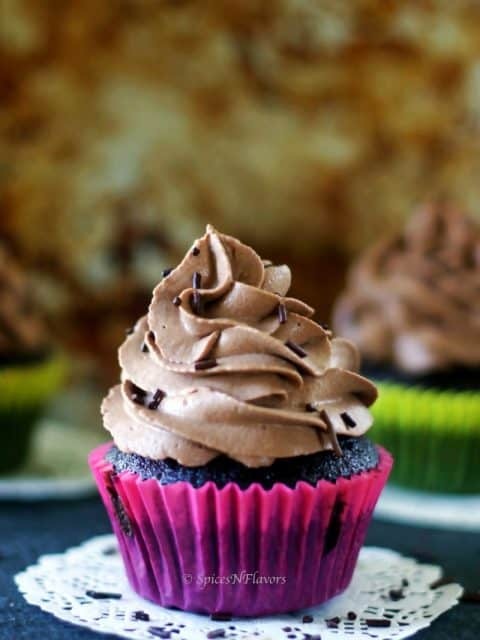 However, there is also another secret ingredient that would take these basic chocolate cupcake recipe to another level and that particular ingredient is buttermilk. 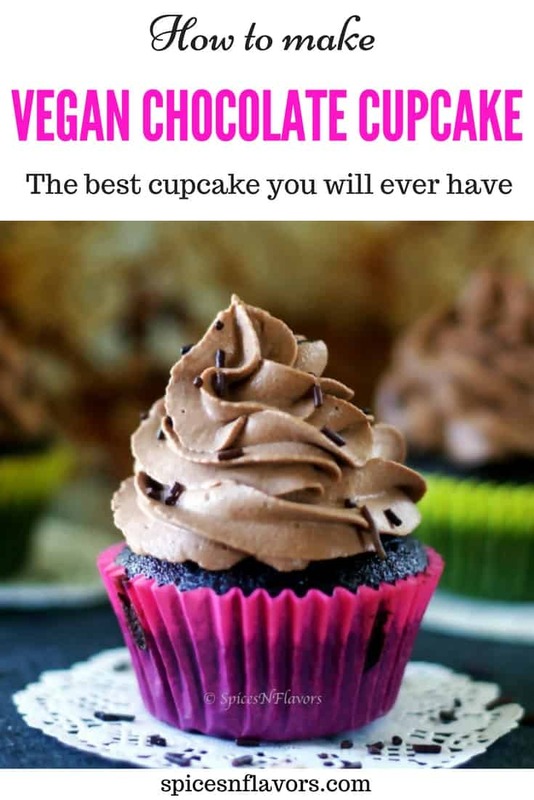 Since we are making Vegan Chocolate Cupcakes today I am using water but if you include dairy products in your routine then definitely try this recipe with buttermilk too, you will love it. Find the details for making your own buttermilk at home in the notes section below. C. Apart from that, these vegan cupcakes are also light, soft and fluffy. Tastes so rich and chocolaty because of the good amount of cocoa powder that we are using. D. You can use this same recipe to make a chocolate cake. In fact, I have already shared the chocolate cake with whipped cream frosting recipe on the blog before. Linking it up here do check it out. E. Also, you can use the same recipe to make a red velvet cake. That’s the advantage of having basic cake recipe because we can definitely modify it and make whole new recipes out of it. This Vegan Chocolate Cupcakes recipe is adapted or I must a continuation of the chocolate cake recipe without milk that I have shared previously. 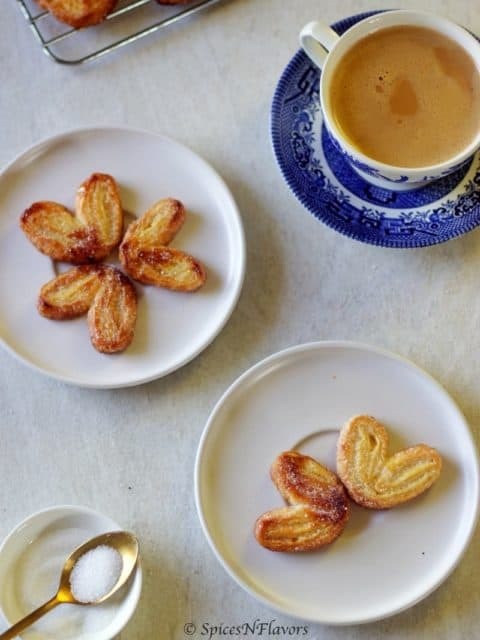 Sorry if you guys thought that this is a repetitive post but like I said earlier I am just trying to compile a list of recipes that a baker must have in their books. Neither do we have eggs nor do we have curd (yogurt) in this recipe. Then what makes this cake rise and hold its shape and at the same time give us a perfect light and fluffy texture? It’s nothing but the reaction between the raising agent – soda and vinegar which creates lovely air bubbles or air pockets in the cake making it light and fluffy. One more ingredient that keeps it moist and fresh for one whole week; yes that long is Oil. Since oil does not solidify at room temperature unlike butter; this cake stays moist and soft throughout the week. I will share a secret with you. If you have been watching my vlogs on Youtube you know that I generally shoot my videos on Saturdays. So just like any other Saturday I shot a video for this recipe as well on Saturday. But when I sat down to edit the video on Tuesday night I realized that I do not have a shot of the sliced cupcake to show you guys the texture within. Luckily I had two of these vegan chocolate cupcakes that were left. So on Wednesday morning, I shot the sequence to show you guys the texture which you can check out in the video for yourself. Five days up and still moist and soft ready to be consumed. Can you believe that? Soft and fluffy, rich, chocolaty, moist, simple and easy to make from scratch these perfect eggless chocolate cupcakes are a keeper’s recipe. Sieve the dry ingredients mentioned above into a bowl. Make three wells in it and add vinegar, vanilla and oil in each well or depression. Divide the batter evenly between the cupcake lines in the muffin tin filling upto 2/3 or 3/4 the total height. Bake in a preheated oven of 180°C for 18-22 mins or until a toothpick inserted in the centre comes out clean. 1. You can use lemon juice in place of vinegar whichever is available handy at the moment. 2. Use Milk in place of water for even moister cake. By the way, guys I have used this mind-blowing and perfectly smooth chocolate whipped cream frosting to decorate the cupcake. 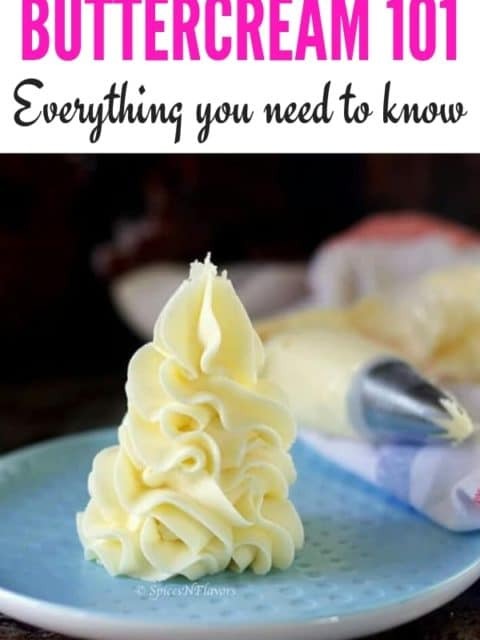 Since it is not vegan I have not included it here in this post rather made a separate post for the frosting because it is definitely a must try recipe. Definitely check it out here. If you are looking for some vegan frosting to decorate the cake then definitely check it out here or here. If you like my today’s post then definitely let me know by tagging me, tweeting me or instagram me. I would love to follow you and your posts. Can any recipe get simpler than this? 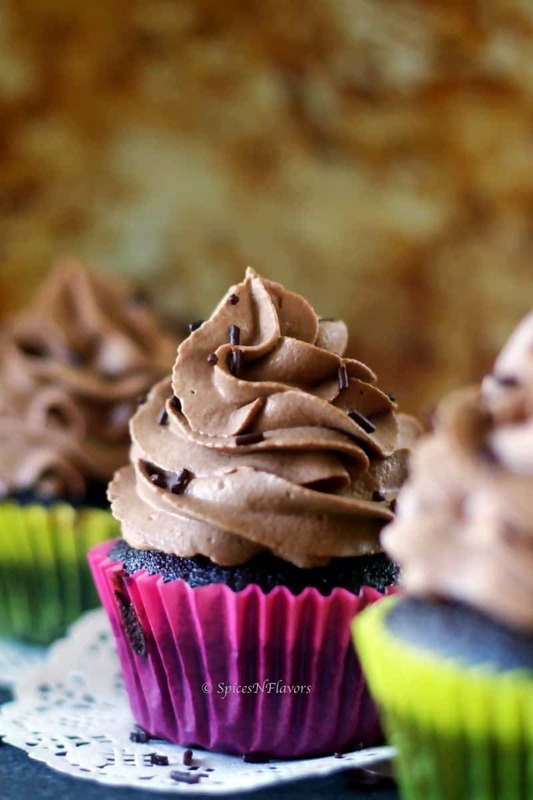 I hope you enjoyed this simple homemade chocolate cupcakes recipe. Perfectly soft and moist cupcakes made without using any dairy products is surely gonna impress everyone. Which is that one basic recipe that you absolutely love and have it in your records for years? Do share with me in the comment section below. Enjoy these Vegan Chocolate Cupcakes with a big dollop of frosting or enjoy it plain as a tea time cake. Either way it is one keeper’s recipe.